Sean Tha, a resin collector since 1998, points to resin he collected and sold to earn income. His resin business supports his family, including the cost of school for his children. 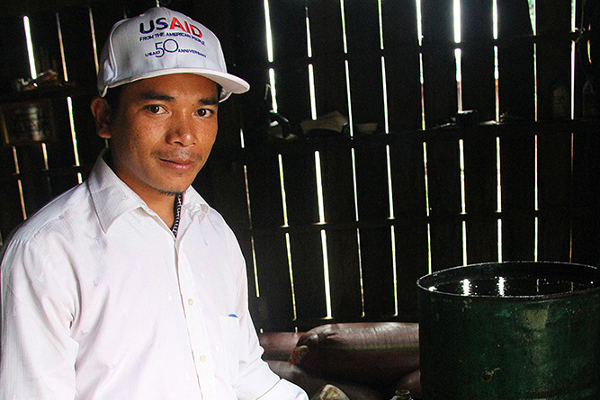 Villagers in Poupet, a small community in Cambodia’s Mondulkiri Province, are earning more money from collecting and selling resin than ever before and are supporting their families without jeopardizing the forest resources they need to survive. But that wasn’t always the case. Low resin prices, as well as shrinking rice yields due to unsustainable farming practices, brought increasing levels of poverty. Villagers turned to cutting and selling their resin trees (which were passed along through generations) and poaching wild animals to generate income. Simple market strategies provided the solution. The Supporting Forests and Biodiversity project team learned that villagers didn’t consolidate the resin they harvested — which would command a higher price for larger volumes — and they didn’t have market data. Resin traders purchased from individuals and offered lower-than-market prices. Resin is valuable for use in a variety of sealing and waterproofing products, and harvesting provided the only source of income during the dry season. Villagers formed a committee to collect resin and sell in larger quantities to one buyer, and they learned bargaining skills that, backed by current market price information, resulted in doubling the sale price. Additionally, villagers learned improved harvesting techniques and quality measures to ensure the resin met buyer standards. 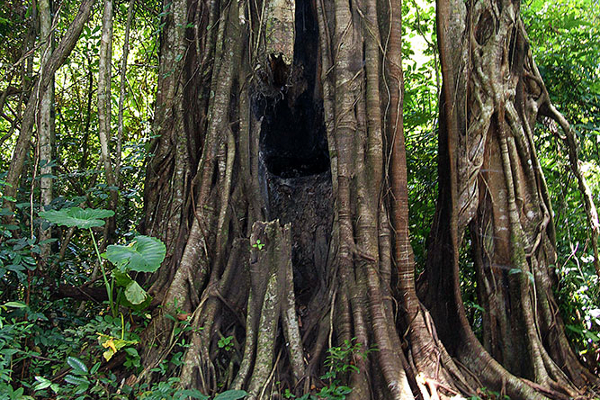 Resin trees in Mondulkiri province. The Supporting Forests and Biodiversity project is a four-year initiative, funded by the U.S. Agency for International Development, to improve conservation and governance of priority forest landscapes to mitigate climate change, conserve biodiversity and strengthen the capacity of Cambodians to reduce greenhouse gas emissions.